The DVD drives still exist on the planet, so the uses of DVD. People still love to use DVDs to store music or video files. Also, there are DVDs available for a newly launched music album or movie. But as you know CD and DVDs are the most sensitive data storage material. Just a few scratches on a CD or DVD the storage material will not even work properly. But what if one of your important CD or DVDs got some scratches and it is not working? Well, the experience undoubtedly would be horrible and that is why we are here to help you out. With this piece of article, we will talk be answering your question which says “how to backup DVD”. Well, there are many ways available on the internet to backup a DVD. However, trying out each and every solution one by one would not be a really great idea. As you will be running the DVD a couple of times in order to backup it from your computer. So there is a chance that the DVD will get more damaged. Before working on any solution or fix in order to backup the DVD. It is advisable to look for the scratches on the DVD at first. Also, you have to make sure that your Computer is able to read the DVD. However, if the DVD has some small scratches then you can clone DVD to DVD very easily with any of the DVD writing software or you can try out the WinX DVD Copy Pro. But just in case there are some minor scratches on the DVD then I would like to suggest you hold on and read the article. Step 1: On the left side function selecting the area, select the Clone DVD to DVD option filed under Full DVD backup category. Step 2: Select your DVD Source Burner and Target DVD Burner. Make sure the target DVD is rewritable or writable and has enough space to accommodate the source disk. Step 3: Set the Temp folder if you do not have two DVD drivers working at the same time. Make sure the hard drive saving Temp folder is large enough (>9GB). Step 4: Click Run button to begin DVD to DVD copy procedure. It will take around 20 minutes or more depeding upon the level of scratches and size of the content on DVD for creating the copy of your DVD. There are quite a lot of applications available on the internet for data recovery job. However, if we talk about the working application that makes the data recovery job quite easy. Then we have to say the name of the WinX DVD Copy Pro. The application is designed to understand the DVD data backup needs of the users. The application comes with many features such as 1:1 clone DVD to DVD so you will be able to get another copy of your damaged DVD. 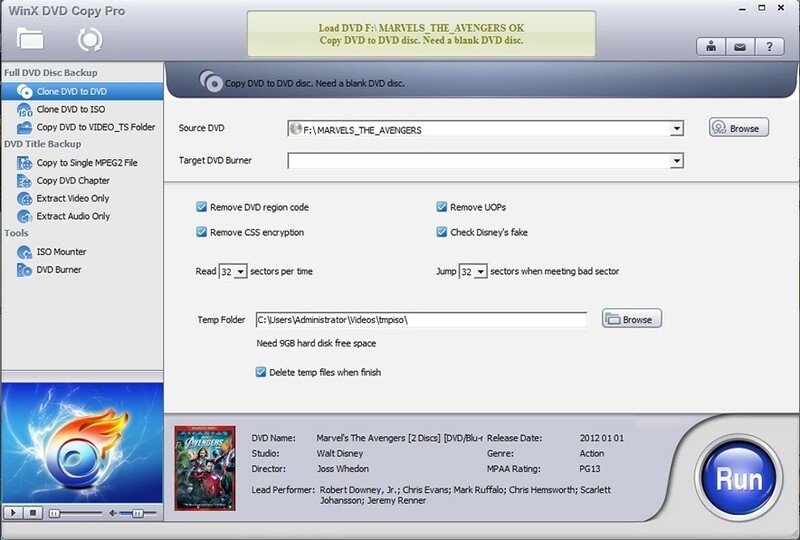 With the application, you will also be able to copy DVD to ISO, make an image or ISO file of your damaged DVD. This will allow you to burn the image file later as well help you to create a permanent backup of your DVDs. The WinX DVD Copy Pro comes with a DVD ripper. This will convert your DVD files into digital media. For an example, if your DVD has a video then the DVD ripper will make a digital copy of the video, like DVD to MPEG2, that you will be able to play the video file on your computer as well on your Smartphone. It will kill the need of having a DVD player just to play a movie from a DVD. Also, the good thing about the WinX DVD Copy Pro application is that you will be able to backup your data from an extremely scratched DVD without wasting much of your time. The clean user interface of the application helps the users to get done with their job. Even a person who does not have much knowledge about the software or computer related stuff will also be able to do the data backup job. It also comes with Disney’s Fake, Sony ARccOS bad sector detection support. Also, WinX DVD Copy Pro is equipped with a feature called sector by sector disc duplication mode. This feature ensures a 100% accuracy copy in quality, structure, and content. Another good thing about the WinX DVD Copy Pro is that it does not use much CPU power while backing up a data or burning an image file. Also if you have an extremely outdated computer then you do not have to worry. The WinX DVD Copy Pro needs a storage of 100 megabytes and you will need only 256 megabytes of RAM to run the application. Also, it supports older windows operating systems like Windows 7 as well you will be able to run the application on Windows 10. The application supports DVD formats such as Blank Writable DVD Disc: DVD-/+R (DL), DVD-/+RW (DL), DVD RAM. As well the application is Decryption supported. Talking about the software company, The Digiarty Software has 11 years of experience in the industry. Over the years Digiarty became a leader in the personal and home-use video audio applications sector. The company mainly develop applications for Windows and Mac-based computers. The company also have some other applications. Such as easy-to-use Mac DVD ripper and Windows DVD ripper/copier/creator, video converter, online video downloader, media player, iPhone file manager, video audio streaming app, etc.